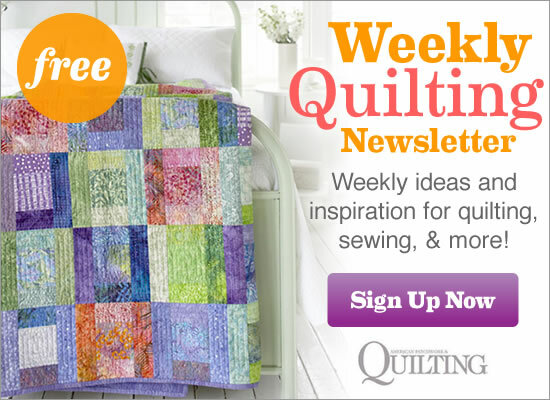 See the featured projects and web-exclusive patterns from the Quilts and More Winter 2015 issue. The Winter 2015 issue of Quilts and More is on sale from October 27--January 19. A solid black binding frames a blue-and-white mini quilt. Soften the edges of a group of squares by making a circular table topper. You can create this Log Cabin tote from 5" squares! Make the most of small pieces of fabric and stitch up this scrappy bag in a weekend. Let holiday-inspired fabrics shine in a quick-to-sew throw. Combine bright tone-on-tone and multicolor prints for an argyle-look table runner that adds a pop of pattern to your dining room. Embroidery and English paper-pieced hexagons are the perfect sit-and-sew winter project. A classic and controlled color combo is enhanced with a mix of blue prints. Dig into your scraps and fussy-cut little bits and pieces to show off motifs atop a pincushion. Join us in 2015 to make the Sew Easy Sampler quilt. Get the fabric requirements here and the individual block instructions in each issue, and then join us on Instagram and Facebook to see what others are sewing with hashtag #qamsewalong. Combine four blocks, sashing, and borders for a striking sampler wall hanging, and then join us on Instagram and Facebook to see what others are sewing with hashtag #qamsewalong. The snow may be swirling outside, but you can enjoy the warmth indoors with this three-dimensional snowman. Scraps of wool-felt, buttons, snaps, and floss combine to make whimsical keychain fobs that can double as attention-grabbing ornaments. Use fabric scraps, pretty paper, colorful washi tape, and an assortment of buttons to create affordable last-minute crafts. Combine cotton and flannel for a cozy cold weather throw. Embroider a whimsical design on a tea towel to showcase your love of sewing or baking (or both)! Enjoy gift-giving and decorating this season by making new stockings. Four different designs offer plenty of possibilities. Bold prints provide eye-catching elements that add up to a terrific quilt. Use plush fabric for the penguin appliqué and pillow back to create a soft and cuddly naptime buddy.